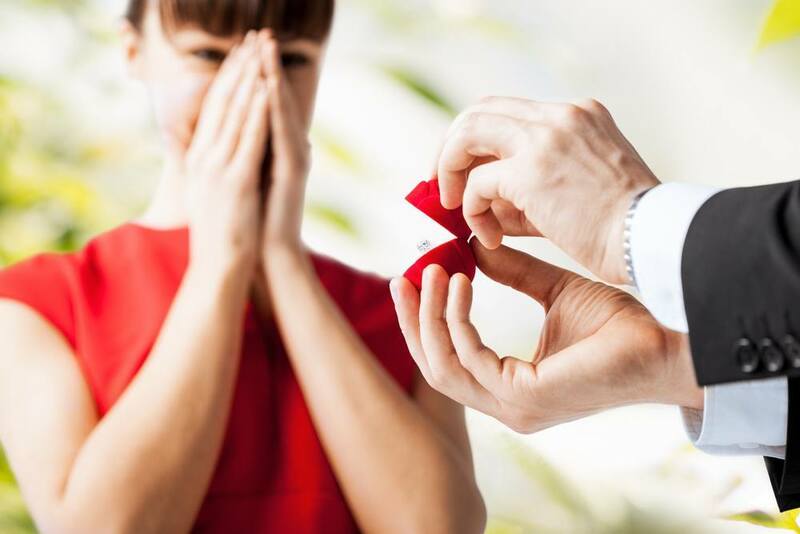 Many women spend years dreaming about the perfect proposal, their very own perfect marriage proposal — the ring, the romantic location, what their future spouse might say. There are hundreds of options: from broadcasting the question on a scoreboard to a traditional, down-on-one-knee proposal at home. And each person’s dream proposal might differ from the next. So how can you make sure you’re crafting the perfect way to pop the question? Luckily, the social app Whisper analyzed the data of their 20 million users to help determine what makes for the perfect proposal. They examined everything from the location to the ring to the time of year. The perfect proposal is all about timing and location. As a couple you must have discussed it at length, the bride-to-be wants a (mind- blowing) surprise when being popped the question. 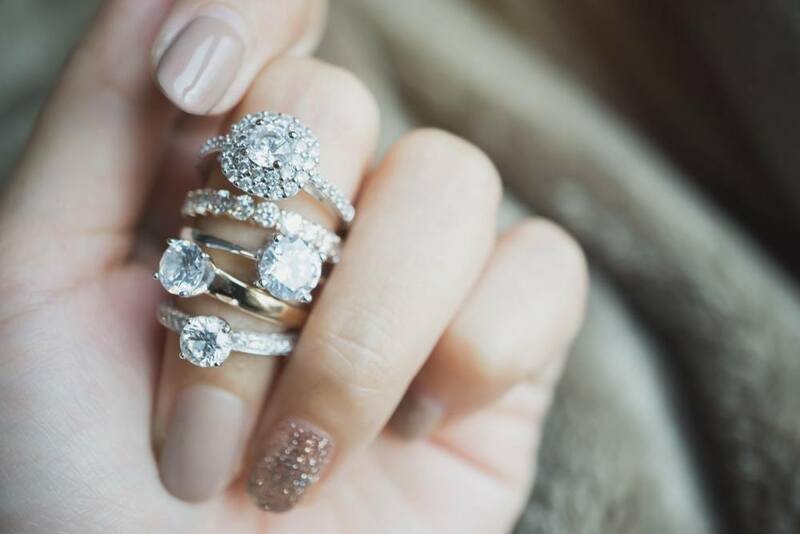 Although most women prefer traditional solitaire rings, make sure to choose the proper engagement ring that will match her personality and style. Timing is everything. As to when the time is right in a relationship, only you can know, but a 2013 poll notes that 25 percent of women begin to expect a proposal once a relationship hits the two year mark. So if you are ready to propose and you have a pretty good grasp that your beloved wants to have that perfect proposal, here are a few ideas to make the magical moment unforgettable! More than half of the people surveyed said they preferred a private proposal. So while egomaniacs Kanye West and Kim Kardashian were all about a stadium proposal on the jumbotron, most would prefer to be asked the question in a more private setting. Long-time bachelor George Clooney popped the question to wife Amal over a romantic dinner in his Los Angeles home, and over fifty percent of women say they prefer this to a grand public gesture. This includes having family members around for the big moment, though that is more negotiable than wildly public settings like the ballpark or a Broadway theater. Location is crucial though — not any old place will do, and most couples prefer a proposal to occur in a place that holds some significance for them, whether it be their favorite beach, a romantic vacation spot, the restaurant where they met, or in front of the Magic Kingdom castle at Disneyland. Because so many prefer a private proposal, a deserted beach has been named the overwhelming favorite for an ideal proposal spot. Holidays are both a popular and cliché time to propose, so it varies from person to person whether they want their proposal to align with a holiday. December is the most popular time for proposals (Joe Manganiello asked Sofia Vergara to be his wife on Christmas Day), but February and Valentine’s Day fall below the entire month of January in their popularity, coming in fourth place out of all 12 months. June occupies the third position, being the ideal sunny month for the perfect proposal. Most women have an idea about their dream engagement ring (and often drop hints to their partners), but how do you pick the perfect one and maintain the element of surprise? Remember that simple is best–over 55 percent of women state they’d prefer a solitaire engagement ring to a flashy, multi-carat extravaganza. Rather than going for cost or pizzazz, stick with a ring that has personal meaning attached. If you have a family heirloom (either a complete ring or stones that you can turn into a ring), that’s always a good bet– Prince William had women swooning when he proposed to Kate Middleton with his mother’s iconic sapphire ring. If your mother wasn’t Princess Diana, you can find other ways to make the ring unique and personal– Taylor Kinney famously had “T ♥ S” placed on the band of his engagement ring for Lady Gaga, making her ring both personalized and one-of-a-kind. So now you’ve got a ring, and you’ve picked a day and location. How exactly will you pop the question? A traditional down-on-one-knee “will you marry me,” writing in the sand, or something more unusual? No matter what you choose, make an effort to maintain the element of surprise. It’s inevitable that many drop hints and once a relationship reaches a certain stage, a proposal may always be in the back of their mind. In spite of this, the majority of women want to be surprised and 32 percent surveyed say they want to be completely caught off guard and shocked when the moment comes. While traditional proposals were once the bread-and-butter of engagement scenarios, nowadays people want proposals that are creative, unexpected, and speak uniquely to their relationship. While 20 percent of women still want their partner down on one knee and 10 percent want their partner to ask their parents for permission, the traditional proposal is on its way out. Think of viral proposals like a 60-plus person choreographed lip-dub extravaganza all set to Bruno Mars’ “Marry You”–one of the most popular proposal videos making its way around the internet. The video is a supreme example of meticulous planning and creativity resulting in a truly unique proposal (albeit it eliminates the privacy aspect that many women prefer). 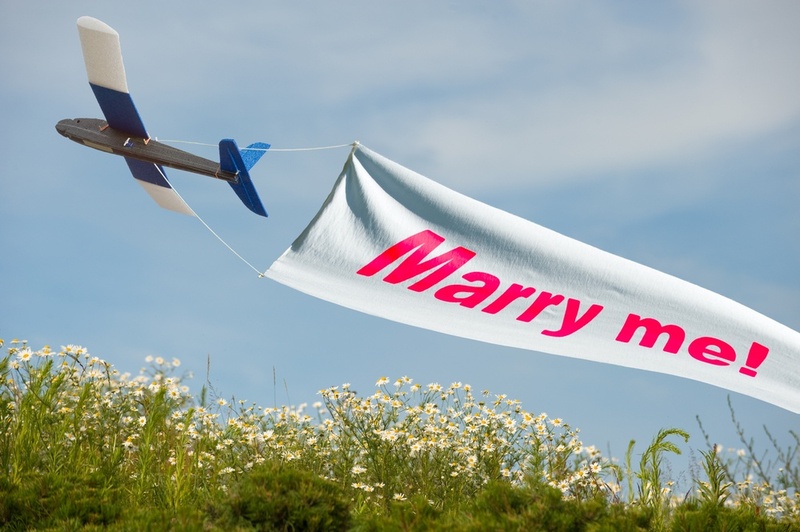 But the most important factor in a proposal is a personal touch–if a certain song, movie, book, travel location, etc. brought you together, then featuring that in the proposal is a testament to your memories as a couple. Did you unite over your shared love of Disney movies? Animate your own proposal video or include a Disney character in your proposal. Forego the tired ring in a champagne glass and place it somewhere unique: Nick Cannon encased Mariah Carey’s engagement ring inside a candy Ring Pop, and Disney star Corbin Bleu asked his fiance to marry him with a ring inside a glass slipper! Perhaps, you are big Harry Potter fans and Hogwarts Castle will make a perfect setting. Or maybe you met in college marching band? Consider proposing using a football field or your school fight song. The perfect anything is subjective. What’s perfect for one person may be a terrible proposal for another couple. So the perfect proposal depends on the person and their own personality. The answer isn’t simple, because if you have to ask what the perfect proposal is for the one you love…you might not know them well enough to propose! We give you here the top ideas for the perfect proposal if your better half is a romantique or has a “unique” personality. Dinner proposal. Candlelight, soft music, turned down lights…set the mood for romance. If the budget allows, make reservations at a five-star restaurant. Traditional location abroad. 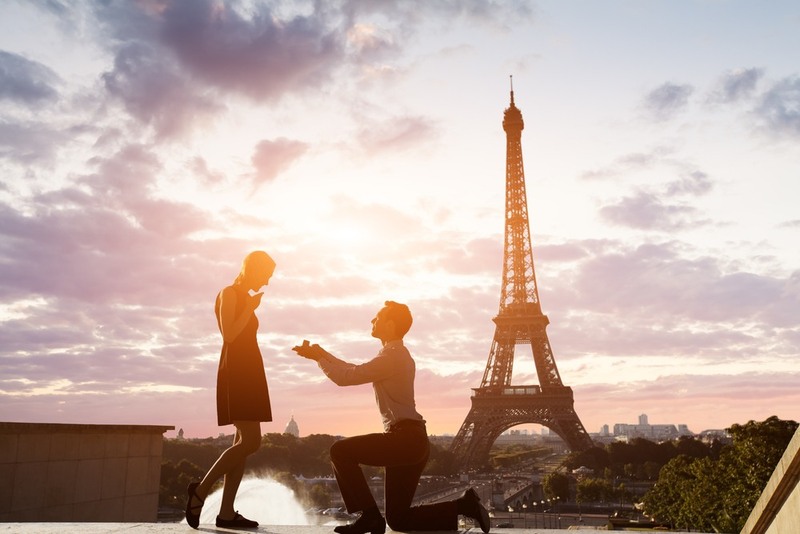 Can you score a trip to Europe and propose under the Eiffel Tower? Or the canals of Venice? 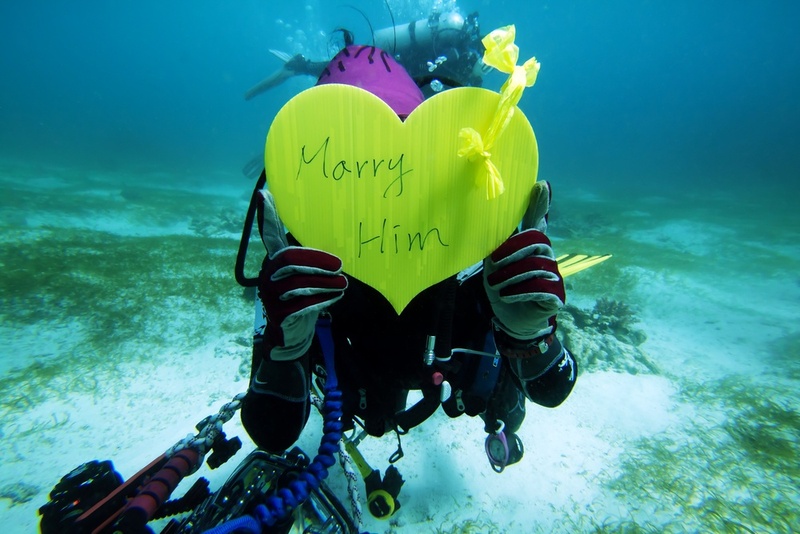 Turn that perfect vacation into the perfect proposal. Romantic spot. If you don’t want to schedule a trans-Atlantic flight, proposing under the stars in the countryside is an amazing choice. Or on a rooftop garden overlooking the city skyline. Pick a romantic location that is meaningful to your relationship. A sweet scavenger hunt. Write up clues in the form of poetry and lead your true love on a scavenger hunt to you…and the ring! You may need to enlist someone to help you with this…and make sure that person can keep a secret! Cosplay. Dress up in a costume of your love’s favorite anime, action or sci-fi character and play out a skit for the proposal. Play ball! Do the two of you love sports? Propose on the jumbo-tron! You’ll probably be caught on camera, too! Rent a billboard. Nothing says forever like a massive billboard with your proposal written for all the commuters to see! Just make sure you rent a board that your beloved drives by on the morning drive! Written in the sky. Hire a skywriter to declare your love in the clouds. Remember to snap a photo for social media! No matter the setting or level of extravagance, the perfect proposal is about how well it embodies your relationship as a couple. If you’re trying to plan a moment they’ll never forget, aim for something highly personalized that is a reflection of your mutual love and respect for each other. Only you know for sure! Because perfection is different for everyone. The perfect proposal is the launching pad for a lifetime together, and what better way to do that then with an approach that signifies what has brought you together, and kept you together in the first place. Only you know how your love defines perfection. So get planning!